Dede: The coconut initially tasted exactly like Kingsbite with coconut because the chocolate starts off hard. You do get the coconut flavor in every bite. I wish it was coconut shavings though that will have definitely added that extra oomph or hold upppppp, imagine if it was kube cake bites – that will have been spalala. The chocolate definitely gets creamier as you chew it which is a plus plus plus. Kingsbite better get on this wave, you can chew chew Kingsbite and it will enter bele far from creamy. Ash: The coconut reminds me of Bounty actually and I went through a real Bounty craze at one point. You don’t get the chewy coconut pieces on the inside but you definitely get the Bounty flavor and flair, never the texture though. I think Dede tried this one straight out of the fridge cuz I definitely had creamy straight off the bat. But yes, Kingsbite time to up your game. Dede: Room temperature, my dear. Ash had it car temperature and you know Accra is hot. Dede: Honestly, not a fan of dark chocolate. All the health benefits fly over my head. The niche dark chocolate is actually manageable, it’s not as bitter as expected. You should have seen my face when I was trying it, I was ready for that malarex feel. I love the creamy effect the chocolate gets once you bite into them a couple of times. There’s a bitter aftertaste which definitely doesn’t win my heart. Ash: I’m the exact opposite, I love dark chocolate. The chocolate is so rich and the taste is just soo ohh-la-la. If you’re a dark chocolate lover, you’ll actually prefer this to Kingsbite and the bitter aftertaste is always a given, but that’s just the chocolate screaming I’m here. It’s not as chalky and it definitely screams fresh in your mouth. I think this dark chocolate is a lot more sweet than other dark chocolate brands you’ll taste, but considering it’s made in Ghana, it wins so many points with me. Dede: Then the chocolate should be nice and not scream in my mouth. Issano from me. Dede: Bruh, I thought this was going to be my favorite. When I first bit into it, there was something that didn’t bounce of my tastebuds, I think it’s the milk. The milk taste is overpowering, it’s milk chocolate but I expect a balance between the chocolate and milk powder. You get used to this taste though because the next bite was creamy goodness. Super weird how tastebuds can adjust. Ash: Loved this too. I won’t even compare it to Kingsbite because they don’t exist in the same class. Kingsbite, I love you too but you’ve got some real competition here! 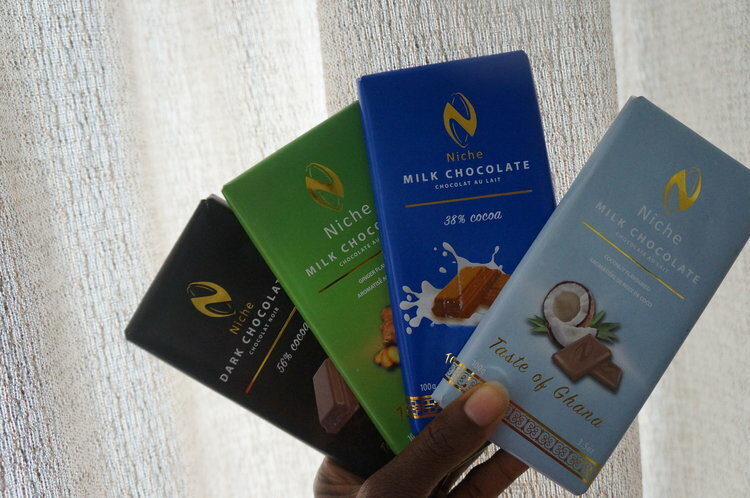 I remember trying the Niche milk chocolate for the first time at Fidelity bank, I enjoyed it so much and was so proud of the taste that I immediately bought some for the whole office to try. Niche defs isn’t no Swiss chocolate, but I do love what they’re serving up. Dede: Super proud that it’s made in Ghana. Dede: At this point, I’m tired of tasting the chocolates. Literally had chocolates for breakkie. 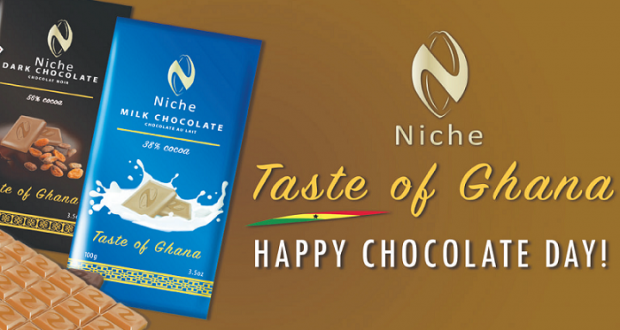 Shout out to Niche for introducing new flavors, keep them coming. When you open the ginger one, the ginger smell hits you like Hey big head. It smells like ahomka ginger like the kind of chocolate that will heal catarrh one time. Dede: I peeped on their insta they have a new flavor coming up, I think its going to be groundnut. Niche if it’s groundnut, ya’ll owe me some freebies. Ash: I love chocolate. I love Niche Chocolate. I love Niche Chocolate flavors. Honestly, Niche Chocolate should hire me as their spokes woman. I ride for y’all.